Yeah... that's right the Electric Prunes, the one and only, original. This is the first studio recordings since Dec. 1967! The opening track "Lost Dream" has a totally authentic 60's sound except for the one sneaky modern synth sound that plays in the background and a more hi-fi production even though it was recorded in a garage studio. I am not that familiar with their music but a few years back my friend Henrik turned me on to the double live LP that was recorded in Stockholm in 1967 and that was great. This line up which recorded this record in 2000-2001 has 3 original members: vocalist Jim Lowe, guitarist Ken Williams and bassists Mark Tulin. They re-recorded the classic song "7&7 Is", originally by Arthur Lee and Love. They utilize a lot of the same 60s effects with the backwards cymbal sound, great echoy fuzzed out guitars and effected vocals. Some fine harmonica playing by Jim as well. "All About Wires" starts with an eastern acoustic guitar before the 60s beat sound comes in full force. "Mujo 22" is quite a psychedelic number and features some far out guitars and layers of voices, drums and other instruments. The band has included a few short segments from the studio ("Big Stick" and "Halloween Ending"), which highlight the fun they were having. A really fun CD. I hope they will make another one. This project is also available as a video DVD. 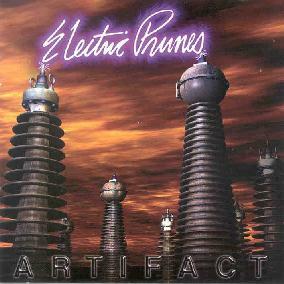 For more information you can visit the Electric Prunes web site at: http://www.electricprunes.net. Contact via snail mail c/o Electric Prunes; 606 Alamo Pintado Rd; Solvang, CA 93463.